The Pentagon's 'Missile Defense Agency' (MDA) now has ground-based deployments in Alaska and California. They are presently holding public comments on a third deployment site either in Michigan, New York, or Ohio. Public comments are due by July 18. The MDA will host open house public meetings at each of the candidate site locations to review the Draft EIS. All written comments received during the comment period will become part of the public record. Providing private address information with your comment is voluntary and such personal information will be kept confidential unless release is required by law. All comments received by the public, including at public meetings, will be addressed in the Final EIS. I am writing on behalf of our organization made up of peace groups around the world. We strongly oppose the deployment of a Ground-Based Mid-Course Missile Defense system in any of the three locations now under consideration – Michigan, Ohio, or New York. Our primary reason for opposing this so-called ‘missile defense’ (MD) system is that it is provocative and a key element in Pentagon first-strike attack planning. At the level of this current program US MD only has any real capability against limited retaliatory strikes after the US initiated a first-strike against Russia or China. Beyond that our concerns also center around the outrageous waste of national resources as this boondoggle program would steal from badly needed programs in our social sector like education, health care, needed infrastructure repair, environmental clean-up and more. At the very time we are facing the reality of climate change these funds could be better used building rail, solar, wind power, and tidal power systems. The environmental consequences of building such a deployment site would be massive. First there is the issue of the environmental damage from the construction process but there are other environmental concerns as well. Particularly dangerous is the likely toxic rocket fuel contamination that would result as the fuel is trucked onto the site and then stored to fuel the interceptor missiles. All across the nation there is an epidemic from perchlorate contamination, a key component in rocket fuel. Somewhere between 20 million to 40 million Americans may be exposed to the chemical. We know that the CDC has found perchlorate in 100 percent of the people they've tested, so there's widespread exposure, through contaminated drinking water and also through contaminated food. The concern is that the fuel additive has seeped into the ground and water in dozens of states – that is how perchlorate has ended up in the drinking water and the food supply. 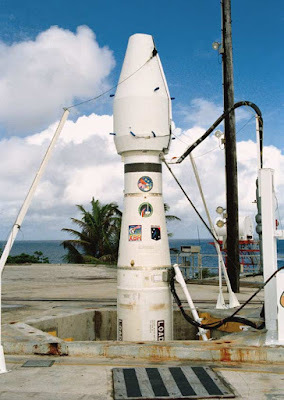 Clearly no matter where MDA chooses to deploy the GBMD system this issue of rocket fuel contamination and other environmental consequences will be a major sticking point. Thus for all these reasons we highly recommend that the MDA make ‘no decision’ on this expensive, dangerous, and highly toxic program. Great work. Thank you Bruce. Peace from Maggie & Kev. Mostly it is a huge waste of resources against a nonexistent threat. More bucks for the military dupplier corporations.